Peter Duncan (former Blue Peter presenter) will appear in THE THREE MUSKETEERS, a fantastically funny re-working of the classic favourite about a theatre company attempting to tour their own production of the same title in wartime England in the 1940s. With the by-line ‘All for one, and every man for himself’, this exciting new production, written and directed by Ian McFarlane, will have its world premiere at the Kenton Theatre, Henley-on-Thames from Thursday 1 to Saturday 17 September (16 performances only), with press night on Friday 2 September at 7.30 pm. Booking opens this Thursday 12 May. It’s 1942 and theatre director Aubrey Everett (famous for all the wrong reasons) is touring the English provinces with his own adaptation of The Three Musketeers. Today, however, the vast majority of his cast and crew are stuck on a train near Salisbury after an air raid took out the bridge over the River Avon. The set took a wrong turn and is somewhere in the Swindon area. The costumes were sent to Canterbury in the confusion. On realising that prolific film producer Arnold St. Arnold is in the audience, Everett insists that – even with just enough bodies to make up the Musketeers – the show must go on. Cue a highly sophisticated yet endlessly silly re-telling of the classic tale, told by a cast of four and a hard-pressed pianist underscoring it all, as they battle with a distinct lack of props, set, costumes, actors… and with each other. Performing alongside Peter Duncan (who plays Aubrey Everett, who in turn insists on playing D’Artagnan) is Matt Ian Kelly (plays Cecil Paige, who plays Porthos and Milady de Winter), a Henley panto favourite (Matt was Dame Trott in Jack and the Beanstalk in December). Other cast are to be announced in due course. 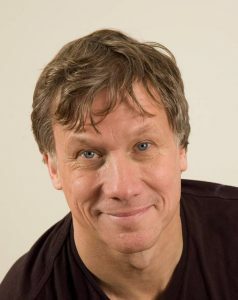 Peter Duncan is an actor, presenter and documentary maker perhaps best known for presenting Blue Peter and Duncan Dares in the 80s. Peter began his career on stage joining Olivier’s National Theatre and spent the 70s working exclusively as an actor. Following his stint on Blue Peter he played various musical theatre roles including the title role in Barnum and Charlie Chaplin in The Little Tramp. More recently, Peter has appeared in the UK tours of Birdsong and Hairspray. Peter also wrote & directed the Oxford Playhouse pantomime for eight years up to 2014. THE THREE MUSKETEERS is produced by the same team that staged Jack & the Beanstalk at the Kenton Theatre last Christmas. Writer Ian McFarlane, who also directs, directed Peter Duncan previously in Betwixt! at the Trafalgar Studios in London. O&Co Entertainment was formed in 2015 by Oli Seadon to make new theatrical comedy. Previously Oli has general managed shows including the UK tour of Simon Callow’s The Man Jesus and the Olivier-nominated comedies Eric and Little Ern and Potted Potter. All orders will be subject to a transaction fee of £2.50.